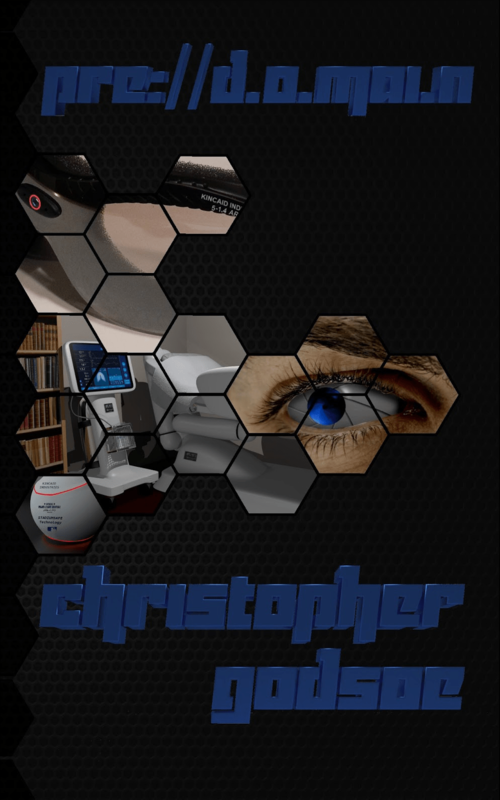 Geeky book author Chris Godsoe, who wrote the recently published near-future sci-fi dystopia book pre://d.o.mai.n, answered a few of our questions about himself and his book. The truth is, that for the longest time growing up, I didn’t even realize I was a geek. I didn’t realize that toying with a Commodore 64 was geeky, or playing Kaboom! with the Atari 2600 Paddle controller, or navigating the square knight in Adventure to the hidden easter egg of Warren Robinett’s name. I didn’t realize that investing hours upon hours of my summer vacation to save the kingdom of Hyrule was considered a worthy sacrifice to anyone else my age. As I look around the apartment now, I see quite a bit of evidence of geek culture. I think my life is probably a lot like a lot of other geeks– we were geeks before we realized what a geek was. Even today, I’ve unwittingly passed on the love of geek culture to my son. Pre://d.o.mai.n was self-published and in other interviews online you’ve expressed how the benefits gap between self-publishing and traditional publishing are narrowing. What are your thoughts about the future and the future of your series in this regard? I see “hybrid” author arrangements becoming more commonplace, where an author has either different books or different versions of the same book being sold through different channels. Hybrid arrangements generally occur when an author has an established ebook following. Rather than sell all the rights off to a traditional publisher, they sell them the print rights, and continue to self-publish the ebook versions. It’s really the best of both worlds, and as more and more authors and publishing houses open to it, it can only help the industry. As far as I’m concerned? I love the freedom of independent publishing. However, I’m open to a hybrid deal, because receiving help on the editing and marketing efforts would free me up to do more writing. Right now, I do almost all of that on my own, and while I enjoy most of it, it can be tough. Plus, it would just be cool to walk into your local store and see your book on the shelf, without you having to have twisted someone’s arm to carry it. Usually working on animation or graphic in Blender. I watch a lot of movies, and spend a lot of time looking for obscure foreign sci-fi on Netflix. Now that pre://d.o.mai.n has been released, I’m hoping to find time this summer to get back out onto the golf course, and to get back to work on the 1984 Fiero SE 3100 twin turbo conversion I’ve been neglecting. Anything you can tell us about where the rest of the series is heading (no spoilers!)? This story in pre://d.o.mai.n is fairly small and intimate, with a small cast and a smaller premise: Miles and his fight to save his mother. The epilogue should give readers an idea where the narrative is heading, though. That’s about all I can say without giving too much away. All of the characters from this book will be present moving forward, and beginning in the next book, tentatively titled darknet, you will learn more about them.The focus will shift away from Miles and begin to follow other characters as the world opens up more for the reader. I wanted everything to evolve over the course of the books– from the characters, to the world they live in, to even the technology they use. If you had to do it all over again, would you change anything in pre://d.o.mai.n? I would have layered in more story threads, more hooks that I can draw from in the future. I try to build everything I do in layers, from the narrative of the story to the book trailer I’ve released. People can watch that book trailer, and enjoy it superficially. After they’ve read the book, they can watch it again and see things they didn’t catch the first time around. You write about near-future wearable tech in pre://d.o.mai.n. What do you think about a marriage of Google Glass and Oculus Rift? The progress lately being made into virtual reality is amazing. All of the technology inside pre://d.o.mai.n is extrapolated from something that exists in crude form now, held together with velcro and bubble gum in a lab somewhere. I started writing pre://d.o.mai.n a while back, and what really made me devote the time to finishing it soon was that much of the technology was threatening to beat it to market. A lesser known product that announced itself during the editing process reminded me so much of the SideARM’s of pre://d.o.mai.n that it caused me a lot of sleepless nights. Google Glass and the Oculus Rift are the first steps into the augmented reality future I explore in pre://d.o.mai.n, and the geek in me is incredibly excited to get my hands on them. The author in me is excited as well, because describing augmented reality is incredibly difficult if people don’t have a frame of reference to work from. It’s been a blast writing this book [pre://d.o.mai.n], and I’m really looking forward to sharing more of that world with everyone. At this point I have more story ideas than time to write them, and it’s my sincere hope that it’s always that way. Read the our review of pre://d.o.mai.n. You can learn more about Chris Godsoe on his website or follow him on Twitter (@cgwrite). Pre://d.o.mai.n can be found on Amazon.